Late pick-up, until 5pm, can be arranged for $25 per week. Camp targeted to ages 8-13. Advance registration required. This Pioneer day camp introduces children, firsthand, to daily life in Wisconsin nearly 150 years ago. 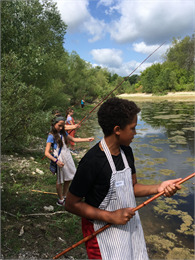 Kids learn the art of blacksmithing, woodworking, candle making, sewing, hearth cooking, and much more as they spend each day exploring the daily activities of Wisconsin's early settlers.